MedShape Weight Loss Clinic introduces our new, improved, stronger, better Signature Weight Loss Supplements line. We have spent the last year redesigning the ingredients in our existing supplement line to create the best products for weight loss to date. We are proud to say we have succeeded. No matter what is stopping you from experiencing optimal weight loss, MedShape has what you need. Ask a MedShape Health Counselor today about our Weight Loss Products and which ones will work best for you. 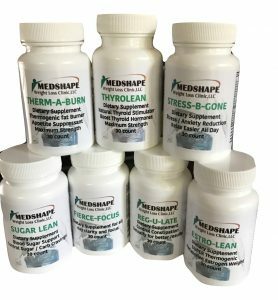 MedShapes Signature Weight Loss Supplement Line. Yes, I’d like to learn how medshape can help me lose weight! Thyrolean – Is your thyroid running slow? Have you ever wondered if you have a thyroid condition even though you have been told your thyroid is fine? Then Thyrolean is for you. Thyrolean will give it the boost it NEEDS to kick start your weight loss. For optimal weight loss, your thyroid needs to produce the proper hormones to keep your metabolism burning around the clock. Therm-A-Burn – Would you benefit from a major appetite suppressant that is also thermogenic? Then Therm-A-Burn is what you need. This Weight Loss Supplement is so powerful, one will last all day long. Say goodbye to no energy and uncontrolled appetites that cause us to sabotage our weight loss efforts. Estro-Lean – Do you hold weight on your bottom half? When you lose weight, do you tend to lose unevenly (on the top half but not in your thighs, hips, rear or belly)? These are true signs your body is Estrogen Dominant and carries Estrogen fat. The pear shape body needs Estro-Lean. Estrogen fat is very difficult to lose on its own and that is why it normally will not respond to diet and exercise alone. This works! And works well! Now you can lose the Estrogen weight and experience weight loss equally though out your body. Sugar-Lean – Do you crave sugar, sweets or carbs? Say goodbye to cravings with Sugar Lean. Lower your blood sugar and lose the belly fat. This is perfect if you are considered Insulin Resistance, pre diabetic, have Diabetes, have Diabetes in your family history or feel you may have an addiction to carbs and sugars. This is a great tool to use when starting any kind of nutrition change that reduces carbs and sugars (which you need to do when it comes to reducing your weight). Bypass the cravings and the urge to turn to stars and carbs. Excellent for late night snackers! Stress-B-Gone – Reduce stress hormones that cause us to gain weight in our mid section upper back and face. Manage stress better and help regulate your hormones naturally. Reg-U-Late – Bypass issues with constipation and lose weight at a faster pace. It is normal to experience constipation when losing weight due to nutrition change. Keep regulated and lose the bloated feeling. Click Here to Get Started Today !